In conjuction with Valentine’s Day, GetResponse is offering a limited accounts offer up to 40% discount for life to new subscribers. This offer only available from February 13, 2017 11AM CET onwards, until 1000 accounts are filled. If you’re looking for a decent email marketing tool to build your list and wanted to save some money, GetResponse may be your best choice for now. So grab this golden opportunity right now. GetResponse is an email marketing tool that is widely used by fellow marketers. It’s an amazing marketing tool that help online business grow bigger. Through following up emails, it helps to provide latest information or offer to the customers. This will make sure customers get to know what’s happening for the company, and thus create a long term relationship. For internet marketer, a decent email marketing tool is pretty important to help them collect leads. By creating a subscriber list, they can reach out to more potential buyer and thus making sure the income stream is automated. Internet marketer use the autoresponder feature in the tool to help send out series of emails automatically. 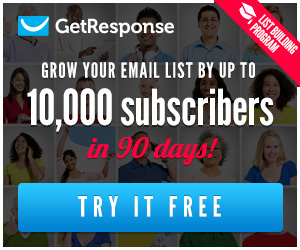 Using GetResponse email marketing tool, you can do all that. Let’s review what’s being offered by GetResponse. As an email marketing tool, GetResponse offer an easy to use platform and dynamic customization to write your emails. There’s pre-made email templates that you can follow in order to create your professional email sequences to your followers. You can choose images from 1000 free iStock images as well to complete your mail. Made with mobile friendly feature, you can make sure your email appears perfectly in the phone. You just have to cross-check in mobile preview when you write the email. GetResponse allows you to write dynamic content as well. You can make the email personal by adding your subscriber’s details on subject or message content. 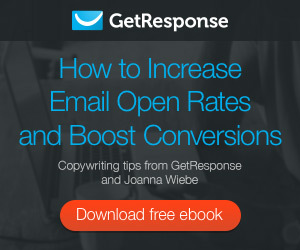 Personal approach email will eventually increase your open rate by 20%. The most valuable asset in GetResponse would probably be the autoresponder. Autoresponder is where you can automatically send email sequences to your followers based on time or action. This is what most marketers use because it can help automate marketing communication with followers. What they did was only a one time job to set up the sequence, and emails will just send automatically. While most of the rookies will just blast out emails to all their subcribers, some experience internet marketer will advise you to segmentize your subscribers. What it means is to segregate your subscribers based on their interest. You may separate them by niche, products that they interested in, JV partners, buyer list, etc. This can be done with GetResponse advance segmentation feature to group similar contacts together. Since your subscribers may be from everyone around the world, it’s pretty hard for you to send out an email that suits everyone’s timezone. This is actually to improve open-rate of your mail. So GetResponse has this Time Travel feature that you can use to make sure everyone will receive the mail on the same time based on their timezone. Another great feature is Perfect Timing. This is based on subscriber’s behaviour and email will only hit their mailbox when they are most active. This will ensure your mail will not be “buried”. Analytics is included in GetResponse as well to help you understand your subscribers better. This will help to create a more engaging email content suitable for your subscribers. And you can design a special content based on their behaviour. Split testing is available as well to help you use the most engaging email to get higher conversion. Last but not least, GetResponse get 99% delivery most of the time. Making sure your effort to send out email will not go to waste. Landing page or squeeze page is the most important element for email marketing. This is because here’s where you will be able to collect email leads. By building your email list, you’ll have the chance to get repeated customers and hence secure your online income. GetResponse prepared you with fully mobile-responsive templates designed for high conversion. You don’t have to worry if your landing page will not collect leads as the ready-for-you templates are proven to work. You just have to spend some minutes to edit the content and you’re ready to go with a professional landing page. Not a techie? Don’t worry. GetResponse landing page editor is a drag-and-drop editor. And there’s no technical skill needed. All you have to do is simple drag-and-drop. You can move, resize, rescale, crop, group, or reshape any elements just by using your mouse. Pretty simple. Getting landing page to be published is also taken care of by GetResponse. What’s different is you can actually use GetResponse subdomains for FREE, or use any domain that you like to publish it. Besides, you can do split testing on your landing page to get your highest conversion design to work. Utilize the data to reach to the right audience. Lastly, you can actually intergrate your favourite analytics and remarketing platforms so that you can track and optimize your landing page for higher conversion. You can even embed videos from YouTube, Vimeo, Wistia, Vidyard, etc. or add social sharing icons. GetResponse is the first email service to actually provide a complete webinar marketing solution to it’s customers. If you’ve been into internet marketing niche, you’ll see almost every huge product launch today comes with live webinar. Why? It’s because it helps prospects to understand more on the product, and it’s engaging. Moreover, conversion rate spike up high because prospect sees value. Thus, webinar marketing solution provided is really a plus point to GetResponse and it helps fellow marketers to improve on conversion. Setting up a webinar in GetResponse is really easy and it takes around three minutes or less. Once setup you can start collect leads when you kick-off the registration for the webinar. And you can actually use the pre-made templates, edit it and send out professional email invites and reminders to make sure your audience remember to attend your webinar. What’s more, anyone can join the webinar from anywhere and anytime by using an Android or iOS device. This is what makes GetResponse webinar marketing solution so powerful. Your audience will get to use interactive tools during the webinar like chat, polls, screen sharing, whiteboards, etc. This will help your audience stays engaged. For webinar organizer, you can actually record your webinar in high-qualify video and it’s available for playback or share later. This will help you take care of the other prospects that missed your session and re-engage them with valuable content. There’s free online storage and recording can go up to 2 hours (max package). Last but not least, GetResponse allows you to do a follow up email sequence to build strong customer relationship. And you can analyze webinar reports for future optimization. This is probably the most wanted feature that all marketers want. Last time it was only available at Infusionsoft solution. But not anymore. Now almost all the email marketing solution raised their bar and include this advanced feature in their service. Why this is actually important? You see, higher level marketers want to make every single mail they send out as personal as possible. So if they can fulfil their prospect’s needs, they will gain trust and hence repeated sales. GetResponse did make a great move in this case, and it’ll become a great help for us. So GetResponse marketing automation solution is easy to use but advanced. This is because it provides you with simple drag-and-drop workflow builder. You can design a very complex campaign and build hundreds of scenarios to suit your subscriber’s behaviour. Furthermore, you can actually see your subcriber’s journey throughout the flow and check your conversion rate. If you’ve no idea how to create a workflow, just let the tool know what you’re up for. All you need to know is your objective and what you want to achieve. There’s already some pre-made workflows that you can use to help drive marketing communications. Some of the examples are: Encourage completed purchases, Keep customers coming back, Lead nurturing strategy or Notify sales representatives. If you want to segmentize your subscribers when using marketing automation, you can actually do tagging and scoring. With these advanced data you can create a conversion path that’s make more sense. GetResponse email marketing tool is really a good service provider in my opinion. It has all the features that’s essential for an internet marketer to build their online business. Comparing with other email marketing service, GetResponse can be considered value for money. With a minimum $15/month fee, you get to use all the 4 features I mentioned above to help you grow your online business. For a beginner in internet marketing or e-commerce, I would recommend GetResponse as your choice to help you collect leads. You know, building an email list will really help you generate more sales and help you grow your business to the next level. And there’s a good news here, like I mentioned above. GetResponse will be having a limited accounts promotion in conjunction with Valentine’s Day. So if you’ve yet to get a GetResponse account, right now is your perfect chance. You’ll get a chance to subscribe with 40% discount from the original price. Meaning from $15/month, it will become $9/month only for life. This special offer will only available on February 13, 2017 11AM CET onwards. And it’s limited to 1000 subscribers. So check out the offer right now. Follow below link. Wow. I didn’t know that GetResponse has so many features. Their marketing automation looks quite easy to use. Thanks for posting! Hey, Tom! Thank you for your comment. Hope you will excel in email marketing!